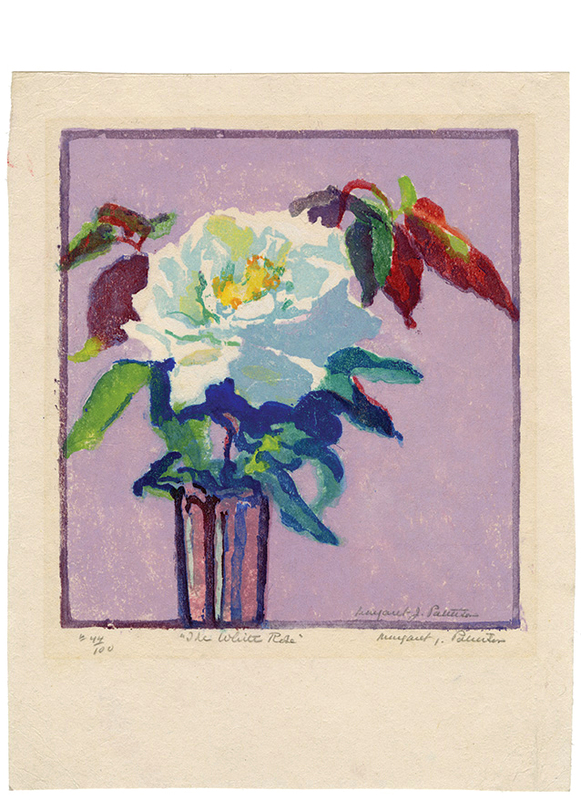 The White Rose - - c.1922, Color Woodcut. Edition 100. Signed in pencil, in the image, lower right. Signed, numbered 44/100, and titled in pencil. Image size 7 5/8 x 7 inches (194 x 178 mm); sheet size 8 5/8 x 10 7/8 inches (219 x 276 mm). A superb, painterly impression with rich, fresh colors, on heavy buff wove Japan with full margins (3/4 to 2 1/2 inches); slight light toning within a previous mat opening, otherwise in excellent condition. Printed by the artist. 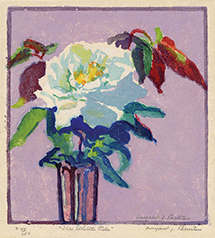 Exhibited: "Margaret J. Patterson: Master of Color and Light," Cahoon Museum of American Art, October 3 - November 12, 2006.